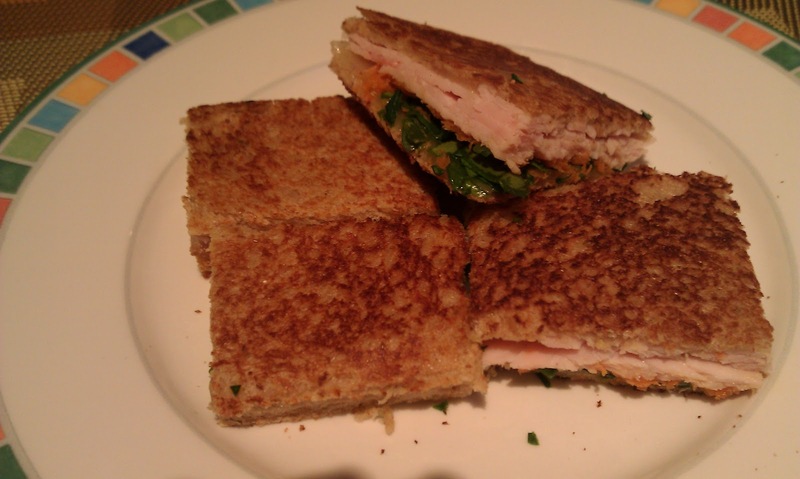 This is a yummy and healthy sandwich the whole family can enjoy. I added chopped baby spinach and grated carrots to add calcium, vitamin A, beta carotene, vitamin C, potassium and folate. My little guy and I had this for lunch yesterday, and he loved it! This is for little one's 10+ months who are eating finger foods. Spray a skillet with cooking spray and place over medium high heat (or use a panini press or foreman grill if you have one). Put all ingredients on bread and place sandwich in the skillet or on panini press. Flip Sandwich and cook for a few more minutes. Remove from pan and place on a plate. Cut off crusts, and then cut sandwich into small pieces for your little one. Make sure it's not too hot. Serve and enjoy!